First Lady Mari Culver delivering turkeys to a Des Moines youth shelter. 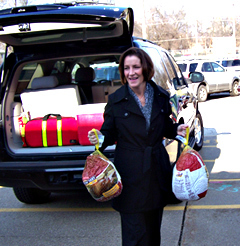 Iowa’s First Lady Mari Culver is delivering turkey, ham and other items for Thanksgiving meals to various shelters around the state today. It’s been a tradition since Governor Culver took office and the First Lady says they hope it raises awareness of the need across the state. “It’s a perfect opportunity for people as they gather with their family and friends this week for Thanksgiving and give thanks, to remind people to think about others who are less fortunate than them, and to remind them to share their blessings with others,” Culver says. Culver says there are a variety of ways people can help and she’s confident Iowans will respond. Culver says Iowans are “awfully good hearted” as evidenced by the high volunteer rate, and she says it’s a busy time, “but we have to take time to think of others” at shelters, meal congregate sites and various opportunities. Mari Culver and Stephen Quirk of YSS. Culver says while Iowans are always generous, the economy this year has created a bigger need. She says some of the homeless and feeding sites that are serving Thanksgiving meals are still looking for help and support as they expect to serve a much larger number of Thanksgiving meals. The turkeys Culver is handing out were donated by the Iowa Turkey Federation and the staff at the governor’s office donated other items such as stuffing and potatoes to go with the birds.